Gaming systems and small form-factor (SFF) PCs have emerged as bright spots in the desktop PC market that has been subject to severe challenges recently. Many vendors have tried to combine the two, but space constraints and power concerns have ended up limiting the gaming performance of such systems. 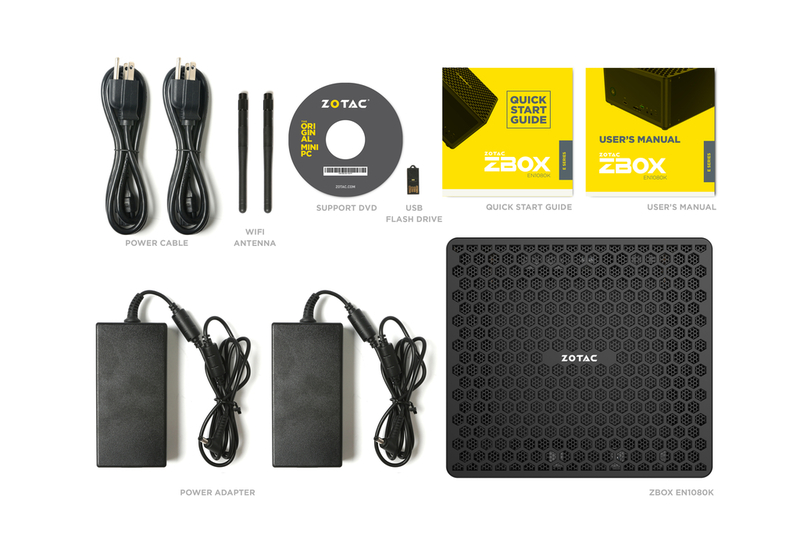 Zotac, in particular, has been very active in this space with their ZBOX MAGNUS series. Starting with the ZBOX MAGNUS EN980 (Intel Core i5-6400 / GTX 980), they have been on a regular release cadence - in mid-2016, we saw the EN1080 with an updated Pascal GPU, and the CPU upgrade to Kaby Lake in the EN1080K came to market in Q3 2017. The third-generation flagship ZBOX MAGNUS fixes some of the shortcomings that were identified in the EN1080 with respect to the system design. Main amongst them is the use of a better thermal solution for the M.2 SSD. We also have a CPU upgrade from Skylake to Kaby Lake (The Core i7-6700 is replaced by the Core i7-7700, while retaining the same B150 chipset). Based on these updates, the performance of the EN1080 and EN1080K should be quite similar, except for the benefits offered by the slightly faster clocks in the Kaby Lake CPU. In this review, we will take a look at the performance of the EN1080K and also determine the areas where Zotac can improve in the upcoming products in this lineup. 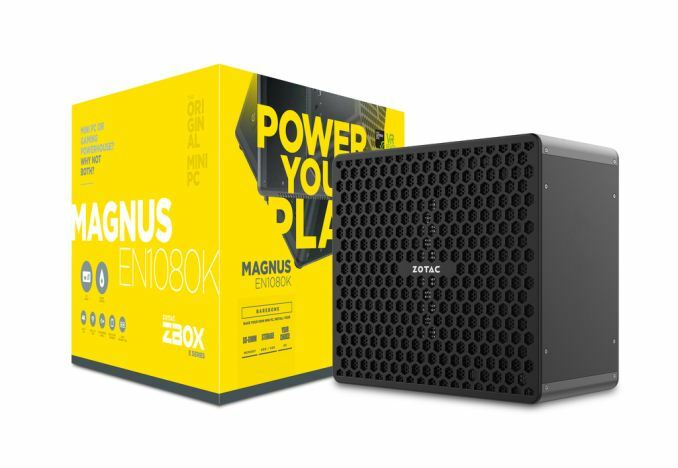 The Zotac ZBOX MAGNUS EN1080K came into the market approximately 6 - 8 months after the release of the EN1080. The claims for the flagship have continued to be the same - a powerful VR-ready gaming mini-PC that is equipped with a high-end desktop CPU and GPU. In terms of physical footprint, the EN1080K continues to be the same as the previous versions (EN980 / EN1080) (5.85L / 225 mm x 203 mm x 128 mm ). Putting a high-end desktop CPU and GPU in that form factor with a liquid cooling system is technically impressive, and we have given the chassis and cooling system enough praise in the reviews for the EN980 and EN1080. The EN1080K retains the industrial design of the EN1080, with its front panel HDMI port to enable easy hook-up of VR systems. The fancy LED lighting (controllable via the Spectra utility) is also available. In addition to the main unit, the PC package also includes two 180W (19.5V @ 9.23A) power bricks along with US power cords and two WLAN antennae. A quick start guide with installation instructions for the memory and disk drives, a user manual and a read-only USB key with the drivers round up the rest of the package. We received the barebones version of the ZBOX MAGNUS EN1080K. In order to complete the build, we used the same components that were used in our EN1080 build - two 16GB Corsair Vengeance DDR4 SODIMMs and a 512GB Toshiba OCZ RD400 M.2 2280 PCIe 3.0 x4 NVMe SSD. The Corsair SODIMMs can operate at up to 2667 MHz, but, in the EN1080K, they are capped at 2400 MHz (compared to the 2133 MHz for the same SODIMMs in the EN1080). The Toshiba OCZ RD400 operates with the full PCIe 3.0 x4 bandwidth. Note that OCZ's custom NVMe driver is needed to obtain the best performance out of the SSD. Internally, the EN1080 / EN1080K uses the B150 chipset (compared to the H170 used in the EN980). However, given the configurability options (only the DRAM and SSD / HDDs are left to the end user to complete the hardware configuration), the choice of chipset really doesn't matter. Obviously, if Zotac were to go back to the specifications stage and look into more peripherals I/Os based off PCIe bridges, the B150's limited number of high-speed I/O lanes might be problematic. In terms of the audio codec (Realtek ALC892), Wi-Fi (Intel AC3165), LAN controllers (2x Realtek RTL8168), USB 3.1 controller (ASMedia ASM1142), and the SDXC card reader (Realtek-based USB 2.0 bridge), the EN1080 and the EN1080K are the same. Why Mini PCs cost more than a Laptop or proper desktops?